Our bodies are connected through all sorts of pathways that help them function properly. That’s why, when something is not working as it should, there are indications of that problem showing up in places we can least expect. A lot of people say that our face is the greatest indicator of our health. 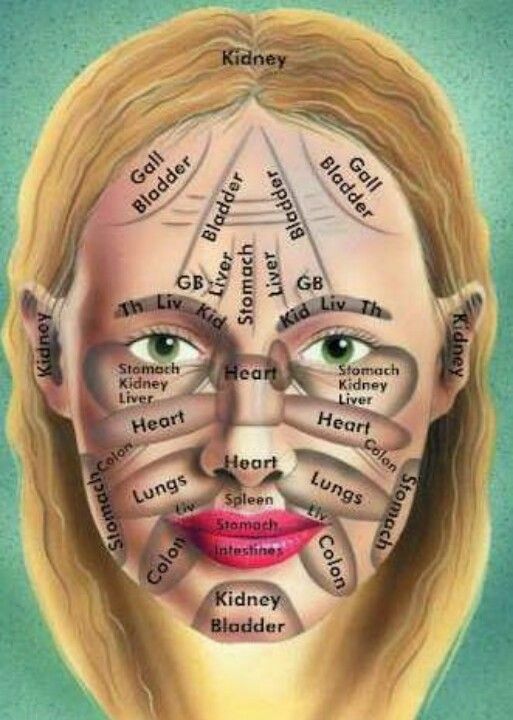 A practice based on Chinese teachings called “Face Mapping” examines the location of acne on the face to diagnose internal diseases. “It is based on Ayurveda practices and ancient Chinese medicine, and its principles have started to be integrated into some Western medical practices,” explained Dr. Michael Shapiro, board-certified dermatologist and Medical Director and Founder of Vanguard Dermatology. Forehead: Poor digestion due to toxins and lack of water. “The solution is to drink water to flush out these toxins,” Shapiro explained. Drink water throughout the day and avoid fizzy and caffeinated drinks as much as possible. Having a big mug of green tea may be helpful, too, since it’s packed with antioxidants that neutralize toxins. T-zone: Your nose is linked to the liver (alcoholics and those with liver damage from causes like cancer sometimes develop a red nose), so acne here could potentially signify liver dysfunction. Ears: The ears are also associated with the kidneys, breaking out here may signal dehydration. Make sure to drink more water throughout the day, and avoid consuming excess salt.